Allie Cobb returns from the publishing world of New York City to her hometown of Rushing Creek, Indiana after her beloved father passes away. The morning after her father’s funeral, Allie learns her best friend’s father and important client of Allie’s late father is found murdered. Allie knows her friend Sloane would never kill her father, but Sloane has become the prime suspect of the local chief of police, who happens to be Allie’s former brother-in-law. 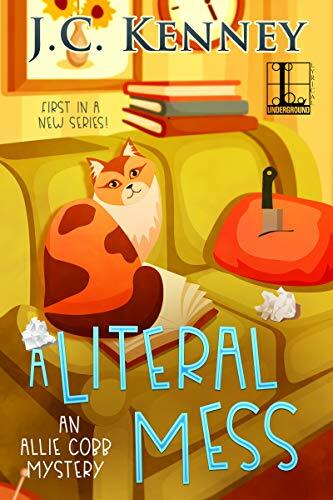 Allie uses the instincts and organizational skills that make her a great literary agent to try her hand at sleuthing to prove Sloane’s innocence. Most cozy mysteries I’ve read are told in the third person, so I was surprised to see this one is told in the first person. However, Allie’s voice is perfect for telling this lighthearted cozy and I really enjoyed it. Allie is intelligent and loyal, if a little too over-the-top when she becomes angry. I liked her, though, and was rooting for her to find the truth about the murder victim’s death. Although the police have quickly zeroed in on Sloane, Allie learns there are plenty of other suspects and she logically goes through the list to eliminate who she can to figure out who really committed murder. She makes the common cozy heroine mistake of trying to confront the potential killer on her own, but that’s the biggest flaw in the story. The author is especially good at dialogue, which is natural and realistic throughout the book. I like that although Matt, the chief of police, starts out very antagonistic, after a while he admits he is in over his head and needs Allie’s help. I like the way they eventually work together and share information to solve the crime. There is also a possible love interest for Allie which has a lot of potential for future books. The ending of this book is satisfying and answers all the outstanding questions while leaving interesting possibilities as the series continues. This is an excellent debut to a new series and I look forward to seeing Allie solve additional crimes.